Honeywell DH70W 70 Pint Dehumidifier is able to handle spaces as large as 1200 square feet (111 square meters). It is quietest in class (between 70 pints dehumidifiers) with a maximum of 50 dB noise. Honeywell DH70W also has a lot of features, electronic controls, it is great to keep healthy and comfortable humidity year-round. Honeywell DH70W looks like other dehumidifiers in class. Nothing special in the design. Control panel and air exhaust on the top of the unit, handles on both sides on the top, air filter and moist air intake in front of the dehumidifier. Water container with water level indicator. The unit has also casters so it is portable. Honeywell DH70W weighs 43 pounds (19.5 kg) that are close to competitors weight. Height x width x depth is 24 x 15 x 11 inches. Honeywell DH70W is equipped with several features. Electronic control panel with the display. Power on/off controls, fan speed control with 2 fan speeds. Timer controls allow to set it automatically on or off after a selected period of time. (max 24 hours interval). Temperature/ timer display and humidity display. Temperature display can be switched between Celsius and Fahrenheit. Humidity control. You can switch a value between 30% to 90%, so the room is kept at a comfortable humidity. Humidity can be adjusted in increments of 5%. Full water tank indicator light illuminates when the water tank is full of water, placed incorrectly or empty. Defrost light indicates when room temperature is too low. Restarts automatically after an energy outage. Eco-Friendly Refrigerant uses R-410A refrigerant. It is eco-friendly and won’t produce ozone. Honeywell DH70W is quietest in the class. It produces 50dB of noise on high fan speed. For 70 pints dehumidifier 14.4 pints water tank is very small. A dehumidifier is continuous drain capable but drains hose is not included. If you want to drain moisture upward or over longer lengths then buy an external condensate pump. It is recommended to clean the air filter every 2 weeks. 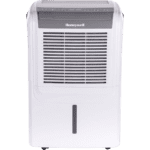 Overall Honeywell DH70W 70 Pint Dehumidifier is a great choice for managing high moisture in large kitchens, bathrooms, laundry rooms, and basements. Posted in Dehumidifier Reviews, Reviews and tagged Dehumidifier, dehumidifier reviews, Honeywell DH70W 70 Pint Dehumidifier.